Why do some people use Twitter while others don't? Why are some people much more likely to contribute to Wikipedia than others? While the majority of Americans have incorporated the Internet into their everyday lives, how people spend their time online varies widely. Demographic characteristics account for some of this variation as do people’s interests. This talk will focus on an additional variable, Internet skills, as an important predictor of what people do on the Web. Even among young adults who grew up with the technology, Internet skills vary considerably with implications for what people get out of their time spent online. Drawing on longitudinal survey data as well as in-person observations and interviews of diverse Internet users, the talk will consider the role of Internet skills in people’s online engagement spanning a variety of domains. 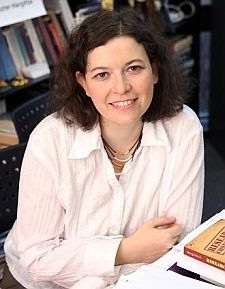 Eszter Hargittai is Delaney Family Professor in the Communication Studies Department and Faculty Associate of the Institute for Policy Research at Northwestern University where she heads the Web Use Project. She is also Fellow at Harvard's Berkman Center for Internet & Society where she spent the 2008-09 academic year in residence. In 2006-07, she was a Fellow at Stanford's Center for Advanced Study in the Behavioral Sciences. She received her Ph.D. in Sociology from Princeton University (2003) where she was a Wilson Scholar. In addition to her academic articles, her work has also been featured in numerous popular media outlets including the New York Times, BBC, CNNfn, USA Today, the Chicago Tribune, the Washington Post and many others. Her work has been supported by the National Science Foundation, the John D. and Catherine T. MacArthur Foundation, the Markle Foundation, the Dan David Foundation, the Russell Sage Foundation, Nokia and Google among others. Hargittai is editor of Research Confidential: Solutions to Problems Most Social Scientists Pretend They Never Have (University of Michigan Press 2009), which presents a rare behind-the-scenes look at doing empirical social science research.